Our B501 IR LED illuminator is a great addition to your night vision setup. With it's 50mm lens and full power from a single battery making this one of the most compact and powerful IR illuminators available. 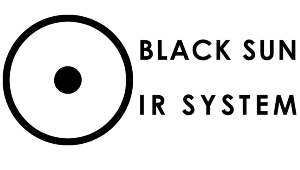 The B502 IR is fitted with the latest Black Sun 2 IR System pill giving 3-5x the output of other IR LED illuminators and a 40% power increase over the standard B501 version. The beam is focussed via a precision aspherical lens and is easily and smoothly adjusted from flood to spot. The illuminator comes with a variable power tail cap tactile switch with memory for Low / Medium / High power outputs. Out performed my nightmaster 67 when lens screwed in about 1 1\2 turns from max! Tried it on my cheapy splatty NV range finder and could illuminate and range objects visibly in excess of 500 metres. Yet to try it on my doubled photon xt but expecting great results. Great piece of kit, thanks for the advice Clive. 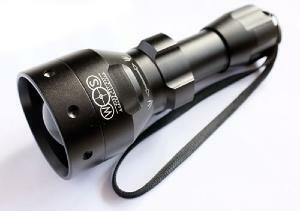 Very good illuminater, compact, light weight, powerful and well made exactly as described. Great torch at a great price. Nice product the only fault with my torch is when your adjusting the beam their quite a bit of play on torch and being front heavy makes it seem worse..the movement is then very visible at greater distant on the beam. Thanks for the review. This is designed so that optimum focus is achieved when the head is fully wound out and locked where there is no play at all. You can add a couple of wraps of PTFE tape to the threads to minimise any movement on wider focus settings.